Anthony is also a fresh face as far as the Llandeilo Lit Fest is concerned. It will be Anthony's first appearance at the Book Fair. Here is a short interview with him. Welcome Anthony. Please tell us about the books you’ll be bringing to the Book Fair. Epic Fantasy, Historical Fantasy and in libraries, Sci-fi & Fantasy. A sprawling tale of adventure and intrigue across three books, the Storm Trilogy follows the lives of two individuals - an immigrant stonemason and a young noblewoman, unwittingly swept up in events that threaten to drag their homeland into civil and wider war. For me, it is a tale about normal people, a believable, realistic adventure-filled journey of discovery, of those who refuse to submit to tyranny and their desire for survival, justice and peace. 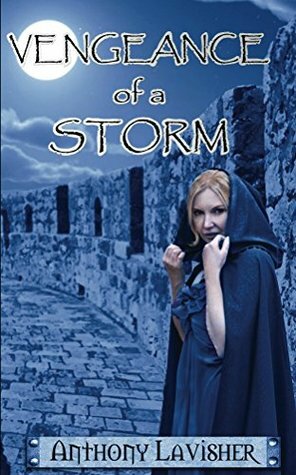 Vengeance of a Storm is the thrilling finale to the trilogy, a fast-paced finale that draws the reader deep into the heart of the action and, hopefully, refuses to let go. I am proud of all three of my books, but if I had to choose one, it would be Shadows of a Storm (Book 2 of the trilogy). After the amazing response to the first book, Whispers of a Storm, the second instalment was, for me, the most important - grasping the baton and the momentum of the first book, passing it on to the finale without dropping it. A lot of plot strands are stitched together in Book 2 and, even now, I look back and wonder how I managed to do it. I have been blessed with so many wonderful comments about my work and it is hard to single out one review alone. I think this recent comment in a review for Shadows was very, very humbling. I missed last year as I sadly had to pull out. There was no way I was going to miss out a second time, as I love Llandeilo. Since moving to Wales I have found my own connection, a love for the country and its people. Working in the library service of Wales has only served to deepen that and my agent is a dear friend, who lives in Llandeilo. I grew up in Hungerford, Berkshire, working for two small electronics firms for twenty years, whilst nurturing my love of writing. I moved to Wales when my girlfriend Amy moved to the Vale of Glamorgan for work. I followed her across the bridge six months later and started working in Barry Library. In 2014 Amy and I got married at Nash Point Lighthouse and we have been adventuring in Wales and further afield ever since. David Gemmell’s tales of heroic fantasy unlocked my passion for writing and it is because of him that I wanted to write tales of my own, tales that would one day, hopefully, fill readers with just as much pleasure. I also love the works of J.R.R Tolkien, Bernard Cornwell and Robert Harris. Born in Berkshire, England, Anthony has always loved writing stories. After many years of enjoying other authors works, he decided to try and give something back to the literary world. From an early age, since reading The Lord of the Rings, he has been inspired to write his own stories. He states that his favourite author is David Gemmell and that his style of writing has been inspired by the sadly missed author.